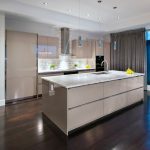 Kitchen Countertop Ideas | Bow Valley Kitchens Ltd. Kitchen countertops define a kitchen’s style and in extension the personality of the kitchen owner. You can have very classy décor in the kitchen but have countertops that spell cheap. This all comes down to your choice for the kitchen countertop and materials. Better technology has given a wider range of choice for kitchen countertops and can be used to accentuate the custom cabinets. But each material has its pros and cons in style and durability. The countertops used in a kitchen are an important design element in any kitchen renovation or remodel. What are the top kitchen countertop ideas to try? Granite and marble are the most popular natural stone types used as kitchen countertops. Granite is a hard, scratchproof material that is mainly found in dark grey color. It is suitable for a busy kitchen as the surface can stand a lot of abuse. Marble is stylish and expensive. Some marble types such as Carrara and Calcutta will cost you hundreds of dollars to install in a standard size kitchen. This is because marble occurs in very attractive colors and patterns. The downside is that marble is porous and prone to scratching which limits it to kitchens with little to moderate use. Quartz is a naturally occurring material but is referred to as engineered stone when mixed with other elements to add color and pattern. It is increasingly becoming popular for its durability, heat resistance, and scratchproof characteristics. It is as attractive as marble but cheaper to install since it does not need any sealing because it is nonporous. Affordability is the biggest advantage of this material. Unlike before, when laminate was dull and boring, advanced technology has given laminate that mimics marble, granite, and wood. Indeed, the style, color, and patterns of the laminate are in the thousands. The biggest disadvantage of this material is that it withstands strong heat poorly, and is prone to scratching. This material is ideal for busy kitchens as it is heat resistant, durable and scratchproof. It can be made more interesting with special stamping and staining techniques. The common tile materials for countertops are porcelain, ceramic and glass. Tiles occur in hundreds of colors, styles, and patterns. Tiles are scratchproof and very easy to clean, but they are prone to breaking from hard knocks. 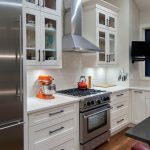 Steel was used in older kitchens but is making a comeback as modern steel can be installed in different colors and styles. It gives the kitchen a clinical look and works very well with contemporary kitchens and lighting. This material gives a very striking visual effect. This contemporary material is unique, stylish and comes in very vivid and vibrant colors. Wooden countertops give the kitchen a warm vintage feeling, is easy to use when preparing food.